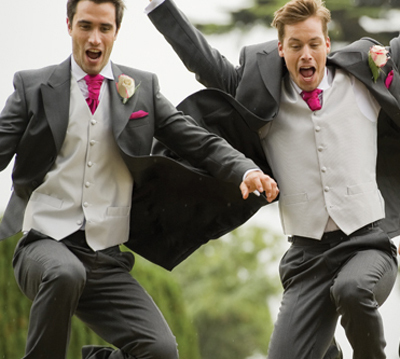 Grooms have never had so much choice and they’re revelling in it.For a formal wedding, the men in the bridal party usually wear traditional morning dress in black or grey – if you’re choosing black, it’s usually teamed with grey pinstripe trousers and a grey waistcoat – and it’s usually teamed with a wing-collared shirt and cravat. Top hats and gloves are invariably carried, not worn and a pair of well-polished black shoes completes the outfit. But the choice doesn’t stop there. Instead of the formal tailcoat, grooms are increasingly choosing the flattering Prince Edward jacket or the stylish Nehru jacket. Whatever you choose, there’s a dazzling array of stunning waistcoats to stamp your personal style on the outfit. Choose one which will co-ordinate with the bridesmaids’ outfits so the bridal party presents a co-ordinated look. Then there’s traditional Highland dress for grooms with Scottish connections or, if you’re uncomfortable with so much formality, a lounge suit is equally acceptable. Most grooms choose to hire their formal outfits – but do make sure you choose a reputable outfitter, who will fit you properly. It’s a good idea for the bride and groom to go for the initial consultation on their own. Then they can choose exactly what the men in the bridal party are going to wear. 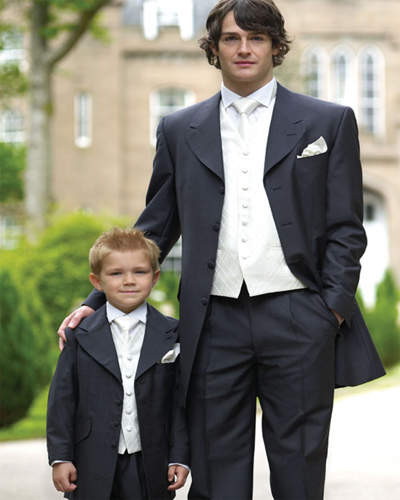 Arrange a fitting for everyone well in advance of the big day and expect to pick up your suits a couple of days before the wedding. If you’re going on honeymoon immediately after the wedding, do organise for all the hired suits to be returned a couple of days later. Independent store, established over 100 years ago, offereing a complete wedding hire service for men and boys. From classic black morning suits to frockcoats, black tie to Highland wear and lounge suits, there are plenty of choices to add fresh zest to traditional wedding wear for the groom. The formal hire department runs alongside the store’s wide range of quality menswear to buy. This beautiful Grade II listed building is ideally located in the centre of Dorchester. Over the last 24 years, Tracy and her friendly and experienced staff have established a first class reputation for exceptional service in the area and their enthusiasm and attention to detail, now extends into their men’s formal hire service. Appointments are recommended but not always necessary.